Usain St Leo Bolt, OJ, CD is a Jamaican sprinter. Regarded as the fastest human ever timed, he is the first man to hold both the 100 metres and 200 metres world records since fully automatic time became mandatory. He also holds the world record as a part of the 4 × 100 metres relay. He is the reigning World and Olympic champion in these three events. Due to his unprecedented dominance and achievements in the athletic field, he is widely considered the greatest sprinter of all time. Usain St Leo Bolt, OJ, CD (/ˈjuːseɪn/; born 21 August 1986) is a Jamaican sprinter. Regarded as the fastest human ever timed, he is the first man to hold both the 100 metres and 200 metres world records since fully automatic time became mandatory. He also holds the world record as a part of the 4 × 100 metres relay. He is the reigning World and Olympic champion in these three events. Due to his unprecedented dominance and achievements in the athletic field, he is widely considered the greatest sprinter of all time. A nine-time Olympic gold medallist, Bolt won the 100 m, 200 m and 4 × 100 m relay at three consecutive Olympic Games. He gained worldwide popularity for his double sprint victory at the 2008 Beijing Olympics in world record times. Bolt was the first to win consecutive Olympic 100 m and 200 m titles (2008 and 2012). An eleven-time World Champion, he won consecutive World Championship 100 m, 200 m and 4 × 100 metres relay gold medals from 2009 to 2015, with the exception of a 100 m false start in 2011. He is the most successful athlete of the World Championships and was the first athlete to win three titles in both the 100 m and 200 m at the competition. Bolt improved upon his first 100 m world record of 9.69 with 9.58 seconds in 2009 – the biggest improvement since the start of electronic timing. He has twice broken the 200 metres world record, setting 19.30 in 2008 and 19.19 in 2009. He has helped Jamaica to three 4 × 100 metres relay world records, with the current record being 36.84 seconds set in 2012. Bolt's most successful event is the 200 m, with three Olympic and four World titles. The 2008 Olympics was his international debut over 100 m; he had earlier won numerous 200 m medals (including 2007 World Championship silver) and holds the world under-20 and world under-18 records for the event. His achievements in sprinting have earned him the media nickname "Lightning Bolt", and his awards include the IAAF World Athlete of the Year, Track & Field Athlete of the Year, and Laureus World Sportsman of the Year (three times). 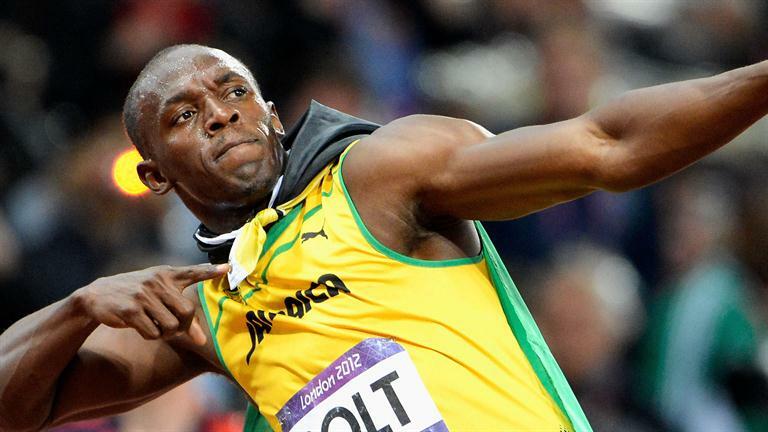 Bolt has stated that he intends to retire from athletics after the 2017 World Championships.